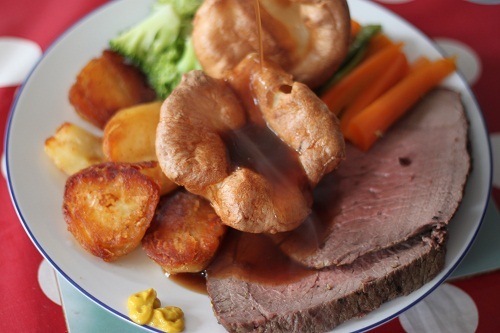 It took me until adulthood to appreciate the magnificence of the Yorkshire Pudding. My children are nowhere near as slow and are already massive fans. Whether turned into toad in the hole (or even my mini toad in the hole) or as an accompaniment to roast beef they are always delighted by their appearance at the table. Stand the batter: I make my batter when I put the meat in and stand it in the fridge until just before I need it. Use a metal pan: I use either rounded Yorkshire pans or a muffin pan (makes huge ones) for individual Yorkshires or a shallow metal tin for one massive Yorkshire. Get the oven hot: as soon as my meat and potatoes are finished I rack up the heat to 220°C and put my tin in to warm with the oven. Hot fat: once the oven is up to temperature, take out the pre-warmed tin and put in your fat. Back in the oven until it is smoking hot – will get your Yorkshires going quickly and ensure none stick. Keep the door shut: Don’t be tempted to open the door for at least 20 minutes or they will collapse. There are no doubt heaps of other tips to help you but those are my essentials. Bear in mind every oven varies slightly so you will need to adapt your style to the oven you use. All of that said one of my friends created the most stunning Yorkshires mixing the ingredients by eye on her first try so it can be down to natural talent! sunflower oil or beef dripping. 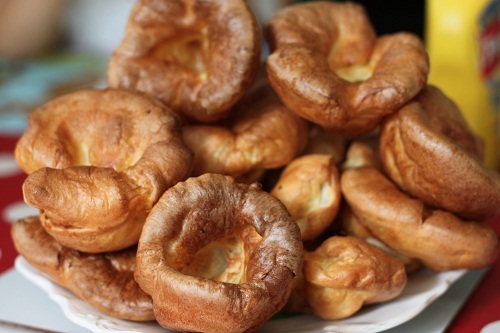 Preheat oven to 220°C (or even 250°C if yours goes that high) – makes 12 Yorkshire puddings. In a large jug, whisk your flour into the milk, once combined without lumps break in the eggs and whisk into a batter. Leave to stand for a couple of hours in the fridge if you have the time. Bring your oven up to temperature, warm the Yorkshire pan then add the fat (about a teaspoon per hole to cover the bottom) and return to the oven until smoking hot. 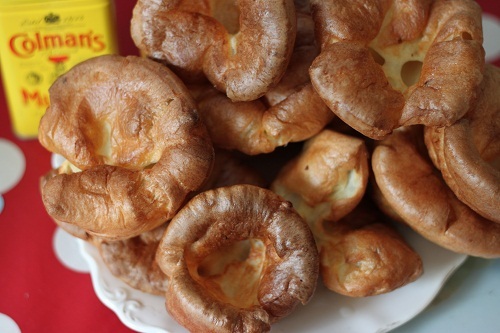 Work quickly: bring the hot fat out, pour the Yorkshire batter from the jug into each hole and gently return to the oven as swiftly as possible. Cook for 20 – 25 minutes (do not open the door earlier) until they are risen and golden brown. Serve immediately with lashings of gravy. I hope they go well and you are always welcome here. Wow. Our Yorkies always collapse, we blame the oven. I do think some ovens don’t get hot enough but do try leaving them 5 – 10 minutes longer next time to see if it makes a difference. Thanks for the tips! This might help me brave a repeat attempt at toad in the hole..
Oh good luck! Hot oven, hot pan, hot sausages, hot fat and you will be grand. It is now my goal to have dinner at your house…. I know people who eat their Yorkshires with Golden Syrup. I’m not yet sure how I feel about this!!! Oh Kat, I’ve just been catching up with your blog and have been through a stream of emotions! Ahhing at Milla starting school, worried whilst reading the Lost Boy post, and just delighted at the beautiful photos of Betsy (so, so gorgeous). Now I’m left salivating over your Yorkshire puds even though I’ve just had my supper. Thank you for a lovely read!